We all love New Jersey and want to be able to give back to the community that’s given us so much. That’s why A.J. Perri created AJP Cares, a program through which A.J. Perri donates HVAC systems to deserving veteran families in our service area. It is an honor and a privilege to give back to those who selflessly served our country so that we continue to enjoy our many freedoms. 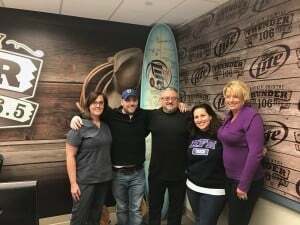 We would like to extend our congratulations to Michael Vasilevich from Brick, NJ, the winner of the AJP Cares contest on 107.1 The Boss and Joseph Cardin from South Amboy, NJ, the winner of the AJP Cares contest on Thunder 106. Michael and Joseph each won brand-new Carrier heating and/or cooling equipment including a Nest learning thermostat and complete installation valued at $15,000! Michael Vasilevich served as a jet mechanic in the Armed Forces, Navy. After serving his country proudly, Michael began his career as a member of the Elizabeth Fire Department. 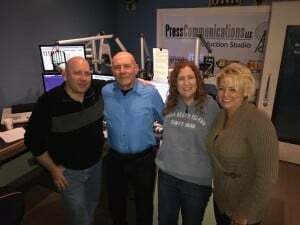 He was named Captain of the EFD and is now retired on a disability. Since retiring, he has been a constant in the lives of his children and their families. In more recent years, he was a victim of 2 major vehicle accidents which left him with a (traumatic) brain injury. His entire life has been turned upside down, along with his wife’s since she is the one in charge of his care. Although he is still capable of many things, he has lost a lot of who he used to be prior to the first accident. While his speech may come slow at times, he has a great sense of humor and enjoys sharing memories of his family and good times. He is a pleasure to talk with and you immediately feel welcomed by his easy smile. Michael is a loving father, husband, friend and role model. Joseph Cardin served in the Armed Forces for 21 years; 10 years active duty in the Navy, and 11 years in the reserves. Joseph is dedicated to his three daughters – 16, 12, and 9 – and has always put them first. In recent years he has faced financial challenges, but he makes sure he keeps the roof over their heads and does whatever he has to do to keep the home going. Joseph drained his savings to make necessary repairs and pay the mortgage. Last winter during a furnace tune-up visit he learned that his HVAC system was just too old (nearly 40 years), and they could not do the tune-up. They also said that the unit has mold inside. Lisa, his fiancé, heard about AJP Cares and immediately nominated Joseph. Joseph admits he is still a little shell-shocked at being announced the winner but is very excited for the peace-of-mind this new system installation will provide him and his family. He looks forward to concentrating his time and thoughts on Lisa and their beautiful family. Michael and Joseph, along with all the veterans who were nominated in the contest, are more than deserving of this donation. We’d like to give a special thank you to the runners up who each won a $500 Home Depot gift card. Thanks to all our Veterans for their selfless service. “We look forward to doing more of these projects this year, where we can continue to help deserving veterans in our community. They sacrifice so much for us, and this is nothing in comparison for what they do for our community.” said Jim Henkel of A.J. Perri.